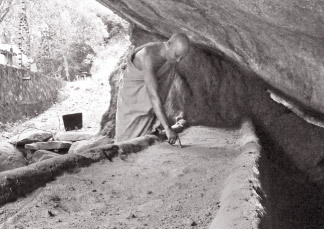 The historic Buddhama cave temple in the Siyabalanduwa divisional secretariat division is facing destruction due to the lack of attention by the Archaeological Department. Chief Incumbent of Buddhama Rajamaha Viharaya Ven Panamyaye Rathanasara Thera inspecting the Welipilla. The mural paintings of the temple which have been dated back to the Kandyan era, are in danger of destruction as the Department has drawn little attention to the temple, says Chief Incumbent Ven. Panamyaye Rathanasara Thera. "This is one of the oldest cave temples in the region. I have written to the Department over this pathetic situation several times that the temple needs urgent conservation without any reply," the Thera said. The country's longest Welipihilla - which is used by the Buddhist monks to teach Sinhala and Pali languages to the members of the Mahasangha and the ordinary people, is on the verge of collapse due to lack of proper conservation. The Thera said that the temple cannot conserve it as it has been declared an archaeological site and the Department should take urgent action to conserve it. "This is the longest Welipihilla in the country and it is on the verge of collapse as rainwater is seeping to the wall", the thera said. Ven Rathanasara Thera said the temple has one of the oldest reclining Buddha statues which was damaged by the treasure hunters several years ago. A Buddha statue made of gold has also been taken away by the treasure hunters. Temple has hundreds of paintings in the cave which need urgent conservation. These paintings in the cave depict the various stages of the Buddha's life. Ven Rathanasara Thera said there are more than 11 caves where the Buddhist monks in the past had meditated. "This place had been a prominent Buddhist educational institute in the past," the thera added. The artifacts of the temple are strewn in every nook and corner of the temple without proper conservation and hundreds of Ola leaves at the temple are also on the verge of destruction due to lack of proper conservation.